Ten teams of experts will hit the ground this week in a yearlong blitz to bolster the Bay Area against rising seas and other potentially catastrophic risks posed by the changing climate. The project, dubbed Resilient by Design, was inspired by a similar planning challenge to rebuild east coast locations ravaged by "Superstorm" Sandy in October of 2012. "We’ve realized that our current systems aren’t set up to address what we know is happening," says Amanda Brown-Stevens, a land use advocate who is heading up the project. "So we want the teams to think outside the box." The teams -- some with nerdy-but-clever names like "Public Sediment" -- comprise multi-disciplinary experts from local institutions and as far away as Australia. The final 10 teams were winnowed down from 51 that applied to be part of the program. "It’s gonna be a very intense couple months," says Claire Bonham-Carter, a member of one of the winning teams, dubbed the All Bay Collective. 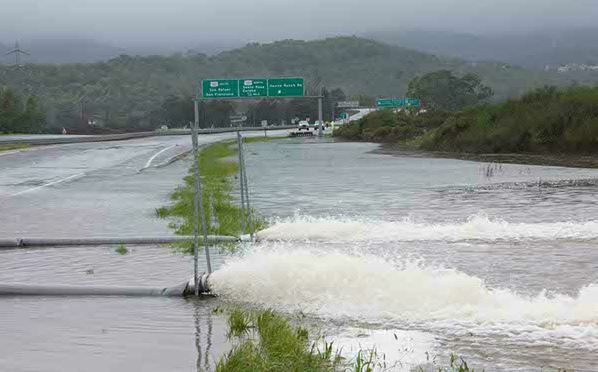 With funding from the Rockefeller Foundation and others, teams will spend the next several weeks touring potential flooding hotspots, from San Leandro's wastewater treatment plant, to Highway 37, the thin strand of road that connects Marin County with points east, at the north end of the bay. Representatives from communities where each of the sites are located will be in on the ground floor, essentially presenting the teams with some of their most worrisome trouble spots. Then the teams will go to work on creative solutions to protect those areas from future flood threats, "knowing that storm surges are getting stronger and flooding is getting more pervasive and then making sure teams are also thinking about seismic vulnerabilities, which are also exacerbated in theses storms," as Brown-Stevens envisions it. Scientists have advised public planners to prepare for sea levels 18-24 inches higher by mid-century and perhaps four feet higher by 2100. But even at current levels, last winter's relentless storms and high tides exposed local vulnerabilities. At least five times last winter, Caltrans had to close all or part of Highway 37 because of flooding from heavy rains. 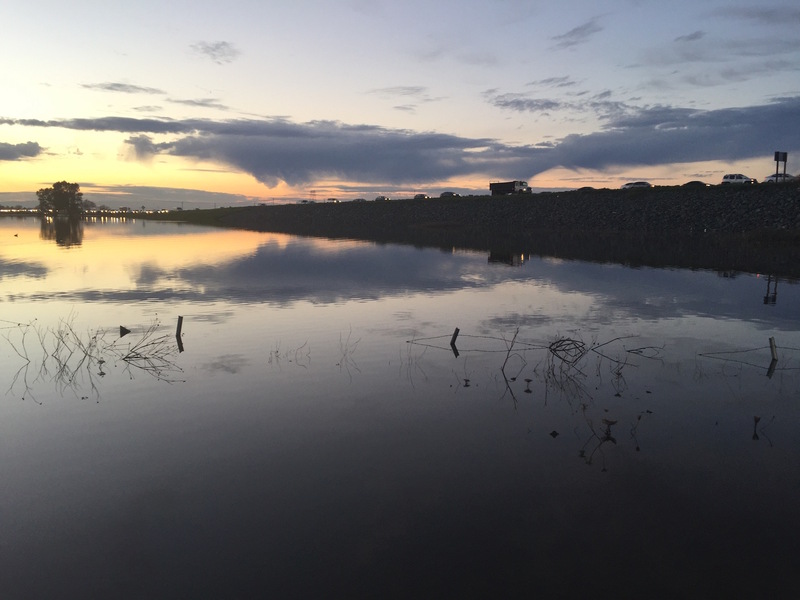 At the height of the season, overflowing reservoirs threatened tens of thousands in Santa Clara and Butte Counties. This isn't the first time international design teams have converged on the Bay Area to attack the problem of rising seas. Nearly ten years ago, the state's Bay Conservation and Development Commission sponsored the Rising Tides design competition, but none of the ideas were actually implemented. Resilient by Design organizers are hoping that this time will be different. "We’re really hoping that at the end of this process we’ll have ten incredible, innovative and implementable designs that are set up for success," says Brown-Stevens. "Set up for success" doesn't necessarily mean funded, but organizers say the teams will have access to financial advisors and be ready with practical funding approaches by the end of the challenge, next May. A director of sustainable development with the international design firm AECOM, Bonham-Carter is still feeling the competitive edge from the team selection round. Asked if she has a dream project in mind, she replies, "That would be giving away the crown jewels." She and teammate Janette Kim, assistant professor of architecture at the California College of the Arts, both say they're excited by the inclusive approach the competition is taking, involving communities in the actual design process, rather than leaving the task to experts and then asking communities to approve and fund it. "We’re looking for big ideas that are grounded in a path to implementation," says Brown-Stevens. With an eye to recent disasters in Texas and the Southeastern U.S., she adds, "In this country we tend to focus on disaster relief — putting in a lot of money after disasters happen. We don’t invest a lot in preparing for the future." If the program pans out as organizers hope, that paradigm might be in for a big shift.